Raising the next Bernie Madoff? All of the kids in my household are into Webkinz in a major way. They rush to get their homework done and their piano practicing logged, so they can kick me off the computer and manage every minute detail of their Webkinz' lives. Annie loves playing games where she can earn Kinz Cash, which she's been saving for a rainy day. Bryce, on the other hand, keeps just enough cash on hand for food, and blows the rest of it on toys and clothes for his Webkinz. Last night at dinner, Bryce turned to Annie and said, "Thanks for the present in Webkinz World, Annie." She looked at him, quizzically and said, "I didn't give you anything." "Oh, yes you did," he replied, grinning. A few minutes later, she wandered into the study to find one of Bryce's Webkinz stretched out in front of a big, new flat-screen tv, the tv that she apparently gifted him. And by gifted I mean that she told Bryce her password, and he logged into her account and sent himself a gift, spending $1,600 of her money. So now Annie's broke, with a tv she doesn't want (he had to return the gift), and a new password. Turning into the mom I swore I'd never be. A couple of years ago, my mom, my godmother and I took Annie to the American Girl store in Chicago to have lunch. At a table not far from us sat a mom and her little girl (and the girl's dolls, compulsory accessories at the American Girl store). The little girl ate and talked to her dolls. The mom was glued to her Blackberry, reading and typing away throughout the meal. Maybe I was imagining things, but the girl and her dolls seemed kind of, well, lonely. My phone broke a few days ago, and on my birthday this Tuesday, a shiny new Blackberry showed up on the doorstep (thanks, hon!). This morning on the way home from visiting teaching, Isaac wanted to go to Chick fil-A. Several minutes later we found ourselves ensconced in a booth, Isaac eating chicken, Maren eating chicken (no, not just drinking chocolate milk! ), and me trying to balance eating a salad with one hand and managing my Blackberry with the other. In my defense, the internet is pretty interesting. This morning, lying in bed and snuggling with Isaac, I found myself crying. I got up, got the kids off to school and hopped on the treadmill. After a mile or so, the tears started again. I'm not at all sad about turning 34. For my kids, there seems to be such symbolic weight behind turning over from six to seven, but from 33 to 34? Not so much. So why was I crying? Every fourth year, I've shared my birthday with a historic national event. For as long as I can remember, I've either been indifferent to the inauguration or downright depressed by the idea of who was taking over. But this morning, listening to NPR cranked at full volume (Isaac came upstairs to close the door to my bedroom because it was so loud that it was drowning out the cartoons), I'm happy to share my birthday with the inauguration. In fact, I feel like this dose of hope and change is the perfect birthday gift to me and anyone else out there who wants a piece of my (symbolic-- since the real one is already gone) cake. It's two weeks after Christmas and I'm finally getting around to posting pictures from the season. Here are some from our elementary school Breakfast with Santa. It was our only visit with Santa this year. After going to see the "real" Santa at Macy's every year during my childhood, I felt a little bit guilty for giving my kids such a cheap imitation. Oh well, there's always next year. My mom was a little bit down about being far from all of her grandbabies this Christmas, so to make the holiday extra-special, she sent a "Twelve Days of Christmas" package to the house. Inside, there were twelve gifts, one to open each day leading up to Christmas morning. Once it arrived, she told us that she wanted a photograph from each day. I managed to add fighting over opening a present, actually opening the present, finding the camera, and documenting the opening for posterity every day except the first day. Here are the pictures. I can't promise they're in perfect order, but the subject matter is pretty cute. Before my in-law's arrive and I get even more hopelessly behind as the blog-as-journal thing, I need to post some pictures of Maren's birthday. We returned from a (very cold and rainy) lovely trip to South Padre Island on the afternoon of Maren's second birthday. She was finally starting to understand the whole Santa thing, and when she saw the pile of presents waiting for her at the fireplace she kept saying "Santa came for Maren!" Baby Stella was a huge hit, as was the wooden birthday cake, which Isaac and Annie immediately appropriated. We tossed most of the Dora cake, and I'll admit that it felt kind of weird to light the Dora candle-- how should we feel about burning our favorite children's syndicated characters in effigy? My brother and sister-in-law sent this book our way for Christmas. It's the story of a summer in a house full of seven boys ages nine and under. I think Bryce would really like it, but I'm not sure I should let him read it-- he might get some ideas. As for me, it made me really glad that I didn't grow up with seven brothers and that I don't have seven boys of my own. The two I do have do a perfectly adequate job of making me happily crazy! I really, really like Malcolm Gladwell. His writing always draws me in. When I see an article in the New Yorker that he has written, I always make sure that I read it (even if it looks way too long). So it should come as no surprise that I took to Outliers like a duck to water. Eddie would tell you that I kept saying "I can't wait for you to read this" as I was reading. In the first section of the book we learn the best time of year to be born to be a Canadian hockey player, how much work goes into becoming a musical virtuoso, and the best year to be born to be titan of Industry or a software mogul. That part of the book is vintage Gladwell-- if you've read Blink or The Tipping Point, you know the drill. The second half of the book is a little bit less closely tied to the title. He calls this section "Legacy" and I guess it's supposed to show what happens after outliers outlie. There are chapters on infighting in rural Appalachia, Korean plane crashes, and Gladwell's own personal story. They're all interesting, but it's a little harder to see them as part of the same story as the first half of the book. Me (putting pizza dough in the food processor): Homemade pizza is SO much cheaper than Papa Johns. Did you realize that the markup is like 300 percent? Me: I mean, flour is maybe $.50, yeast about the same, a dollar each for a can of tomatoes and a can of olives, then three bucks for cheese, so it's about $6 to make three pizzas. When we buy two from Papa Johns and have them delivered, it's about $30. Him: But the thin-crust pizza cooked in that industrial oven of theirs is about a hundred times better what you make. Good thing he doesn't care if I'm frugal. And yes, we're still having homemade pizza tonight. I'm not that much of a spendthrift. After reading my review of Edgar Sawtelle, my friend Anna told me that I had to read Gloria Naylor's Mama Day, a loose reworking of Shakespeare's The Tempest. She loaned me her well-annotated copy (thanks!) and I dug in, not really knowing what to expect. Naylor keeps the supernatural elements present in the original text and the island setting, but she turns the rest upside down-- instead of being the story of white men, it's the story of African American women. It's an ingenious twist, and the story stands on its own even without any prior knowledge of The Tempest (I'll admit that I had to turn to wikipedia for a brief brushing up on the play before delving in). Naylor's characters are so real, so flawed, and so interesting that I didn't want the book to end. I think that George might haunt me, as he may still haunt the island of Willow Springs. Is it cheating to close out the year with a 100-page book of poems? I hope not. Eddie and I have loved Billy Collins's poems for the last decade, and I was excited that a new volume came out just in time for Christmas. Sure, there are some misses, but definitely enough hits to make it worth the sticker price. In fact, since joining the Segullah staff, I feel like it's my civic duty to buy more works of poetry, especially good poetry (I'm not sure that my poet friends would consider Collins good poetry, but I like him). This is the third time I've read East of Eden and I always forget what a pleasure it is to read. When I think of books written by mid-century authors like Steinbeck, I always feel like I have to psych myself up a bit to read them, figuring that they won't get really good for a hundred pages or so. I had that mindset going into reading East of Eden, and I was surprised at how much it grabbed and kept my attention from the very beginning. I read the 600 pages in about three days, and found the story of the Hamilton-Steinbeck and Trask clans to be just as engrossing the third time as the first. I think that East of Eden would probably make it onto Shelah's top ten novels list, if such a thing existed. Matt, Callie and Emmy live in South Boston with their mom, Nikki, who makes their lives miserable. Many kids think their parents make their lives miserable by making them make their beds and take out the garbage, but Nikki really makes their lives miserable-- she brings home strange men, she does drugs, she hits them and she psychologically terrorizes them. When things finally become unbearable, the kids enlist the help of their dad, their aunt and a family friend to help out, but they're unsure if they can ever get truly free of Nikki's clutches. 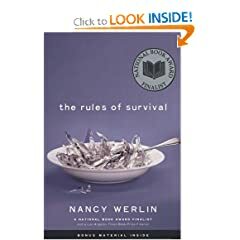 The Rules of Survival is a good book, with interesting characters. It's hard to tell if Nikki is mentally ill or just evil, but reading about her definitely made me feel better about my own mothering skills. It's written for a young-adult audience, and it didn't feel like it reached across genres to be engrossing for an adult in the same way that other YA books, like say, The Book Thief does. If Hot, Flat and Crowded isn't on your to-read list, it should be. Thomas Friedman tackles the big picture of a Green Revolution in America, going beyond the ubiquitous "100 Things You Can Do to Go Green" found in magazines all the time these days, and looking at how America as a whole should approach energy policies and lead the way for the world to stave off climate change and dependence on non-renewable forms of energy. 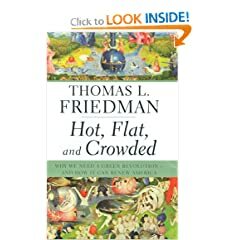 I expected Hot, Flat and Crowded to be an important book, and also a boring book. It is an important book, but it's not boring. Read it! I made Eddie read it, and he said it made him feel a lot better about having Democrats in charge of both the executive and legislative branches of the federal government. I never thought I'd hear him say that! I sort of doubt that most Mormons will really "get" David Sedaris. I'll admit that sometimes I don't get him (but I like him a lot). Most good Mormons will probably put down his books after it becomes evident (by the second or third page) that both the language and the subject matter might have you teetering close to the edge. Even though I know it's bad for me, I like living on the edge (bwahahaha), at least as far as my books go. 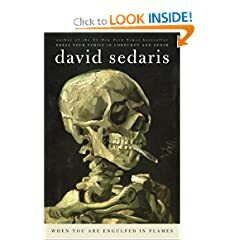 When You Are Engulfed in Flames is 2/3 traditional Sedaris-- hilarious essays drawn from Sedaris's life (which is so much more interesting and weird than mine is-- so unfair!) and 1/3 chronicle of his attempt to quit smoking. 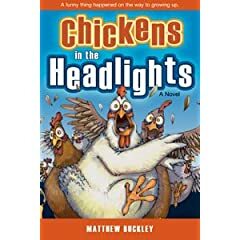 As usual, the stories are funny (even more so if you imagine his voice reading them in your head as you plod through) and the characters seem impossibly bold and bizarre (in a good way, I guess). Eddie and I both read When You Are Engulfed in Flames and I immediately wanted to take out some of his other stuff, and Eddie said he needed to take a break from Sedaris for a while. If you want a glimpse of what you might find in the book, check out Sedaris reading a short passage on David Letterman a few years ago. Thanks, Stadium Pal! Starting off the year with a RACE REPORT! The short story: 3:18 time, 2nd woman, 10th place overall in the Texas Marathon in Kingwood, Texas. The long story isn't too long. The race was pretty much the same as last year. It's still four out-and-back laps on the concrete paths in Kingwood, a Houston suburb. I ran the first lap by myself, the second with the girl who went on to win it. She's 25, from SLC, and super-fast. Then I turned on the Ira Glass and listened to This American Life while I did the last two laps. I went out too fast (as is often the case with me). My first half was 1:35. The second half was 1:43. I think I came in a minute or two behind the winning girl. Three of the top ten (that I know of) were LDS, so it was sort of a Mormon sweep down here in Texas, lol. Anyway, no pics because I drove up and back by myself and was trying to keep things light. Even if we were staying in Texas, I don't think I'd run this race again. Because it's four out-and-back laps, it's really crowded, even though there are only 400 runners. There are lots of twists and turns, and the path is really narrow (just a sidewalk). Many of the racers who do this one are walkers. So I was constantly passing people. That gets really tiring after a while and makes it harder than other two marathons I've run, where you sort of end up settling in with a similarly-paced group after the first couple of miles. It also gets really boring to run the same thing all morning. Anyway, it was a good race. I didn't get a PR and I didn't win it, but I'm still satisfied with my performance.